UPDATE: More information regarding the second Wednesday rally has been provided by one of the organizers, via Facebook. Bring: signs (but not on sticks so you can get thru security), information to distribute or put on tables, and ideas to add to a speak out that is part of the afternoon events. What are your concerns about what the state of Maine should be doing and the directions it should be going in? What do our legislators need to hear from the public? An economy that protects our environment. Reserving Maine money for Maine people. Keeping money out of politics. So with that in mind, here goes nothing! WEEK IN REVIEW: Just a few quick items for this between holidays, look-back edition. 1. The first one is SUCH a goody and relevant to the Christmas season. Ah, sometimes the Governor is simply the gift that keeps on giving! It’s not clear which members of the House of Representatives got stiffed, but we do know that House leaders did receive copies of the book. 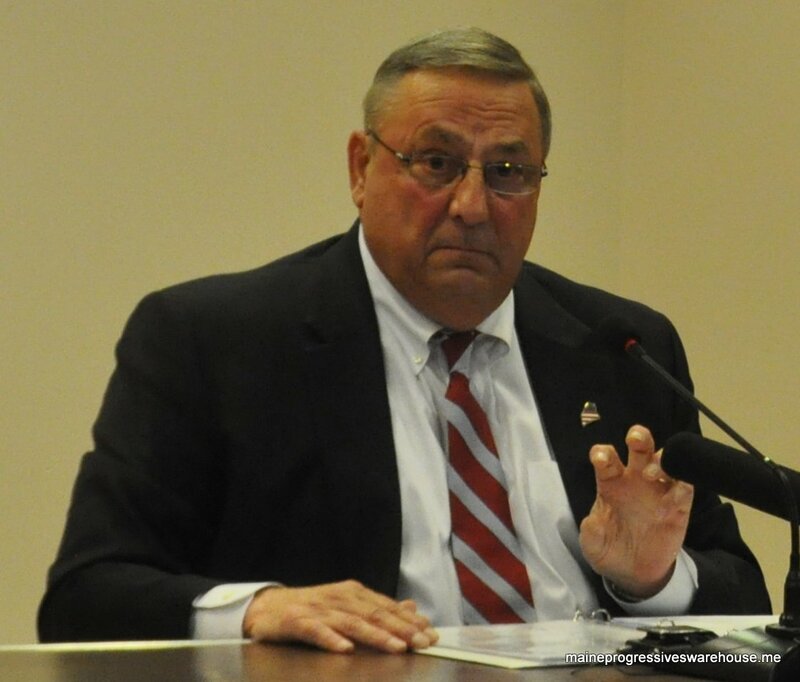 “We only had 80 (copies) — very simple,” LePage said. Many of the people contacted by WMTW News 8 about this story did not want their names attached to this story out of fear of retribution from the Governor’s Office. Interesting, in light of the ongoing Eves/ Good Will-Hinckley situation, that simply reporting “a fear of retribution from LePage” is taken as a given. Maybe the governor should have dragged the “Piggy Christmas Tree” out of the mothballs? That one was such a crowd pleaser! 2. 128th Legislative candidate filings are coming in and being posted online. Link here. 1. Monday, 1/4/16: Maine youngsters go back to school after winter break as parents across the state rejoice (“… and Mom and Dad can hardly wait for school to start again”). 2. Tuesday, 1/5/16 (10a-5p): While the Legislature doesn’t officially come back until Wednesday the 6th, the Appropriations and Financial Affairs Committee (AFA) will be conducting a public hearing the day before regarding LR 2599, “An Act To Combat Drug Addiction Throught Enforcement, Treatment and Recovery” (AUDIO LINK HERE). 3. Wednesday, 1/6/16: The House and Senate come back into the second half of the 127th Legislative Session at 10 am (which anyone with experience in Augusta will know that while many ringing bells will echo in the hallways, they won’t actually start for at least a half hour later than that). But one event that WILL happen as scheduled will be an 11am “State House Rally To Impeach Paul LePage” outside the State House, just under the governor’s second floor windows. The same group rallied in June 2015. Since June, the group has garnered over 20k signatures on a petition calling for the governor to resign. Later the same day, a group called “Alliance For The Common Good Unity” plan to rally as well. On Facebook, the organizers state they are gathering at 1pm, but they are listed as meeting at 2pm in the Hall of Flags. 4. Thursday, 1/7/16: The legislature is in session and the Environmental Priorities Coalition will meet from 11:30-12:30 in State House (SH) Room 334 to issue a briefing on land conservation. So, there you have it- the first of what will hopefully be a weekly column of useful info or what have you. Have a great weekend, folks! Recorded 12/17/15 at Waterville Junior High School. In spite of the Governor’s belief in education-by-screen as he mentioned in this Lewiston town hall, the efforts of the teachers who see students every day cannot be matched by any computer program. The Governor is so wrong if he thinks the solution to educating our students is through a screen. There are innumerable ways that educators interact with students that are missed by technology. The nuances of students’ facial expressions, the look of engagement in an activity, knowing when a student really needs someone to listen, are all things no computer program can replicate. Teaching and learning are all about being a human, being a citizen, being a lifelong learner. Teaching and learning are not all exclusively about technology. Technology is only one piece of the education puzzle. 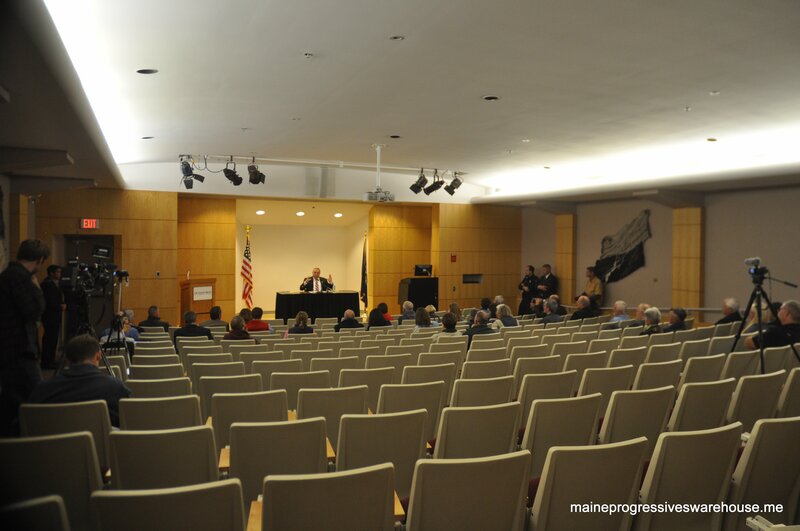 Governor LePage takes questions from an audience member at Lewiston town hall, 10/13/15. The Governor flaunts that 55% funding of education never will become a reality. He clearly doesn’t believe that our students deserve equal opportunities no matter where the student lives and regardless of zip code. MEA believes that 55% is one part of the answer to giving EVERY student in Maine a chance to compete — based on achievement, motivation, and the chance to improve him/herself — not based on family income or community demographics. The Essential Programs and Services (EPS) model for funding education is meant to level the funding to schools, providing a more fair way get resources to schools than exclusively through property taxes collected by towns. Once again the Governor threatens that the Constitution isn’t being followed. He apparently believes that municipalities are responsible for all education costs. But, he either forgets, or doesn’t know, that laws require costs of education be paid by the state (including 55%). School funding by the state would only be unConstitutional if the document prohibited school funding, which it doesn’t. In fact, without state payments to schools how would the Governor propose to fund the charter schools he so loves to promote? The idea of arming educators was discussed in the past and it was quite obvious the Legislature was not willing to risk school safety by having teachers and others carry firearms in our schools. If the Governor proposes educators should be trained to carry guns in classrooms, the MEA will work vehemently against him. The Maine Education Association represents, and only exists, because our educator members in Maine believe that our organization works to improve schools for our students. We are much more than educator advocates, and continually work for social justice in our classrooms and for our communities. There are many examples that discredit the Governor’s pessimistic view of “the teachers’ union.” We do many things including, in just the last year or so, collecting items — including more than 1,000 pairs of socks — for Togus Veterans’ Hospital, partnering with WMTW on an anti-bullying campaign, partnering with WGME and Good Shepherd Food Bank in School Spirit Challenges in southern Maine, partnering with WABI to collect food for hungry families in north/central Maine, and for the last two years (and again upcoming this year) providing books for Maine students. This year, in partnership with a local Foundation, we will once again be providing every Maine first grader in every public school, a book to begin an at-home library. In addition, educators in schools across the state take collections of items for those in need, dip into their own pockets to pay for shoes, coats, mittens and food for students, and have an ever-expanding list of ways they help our students and their families. The Governor, as he is prone to doing, continues to attack public educators by attacking the MEA, as he did again in Lewiston. As I said earlier, the MEA only exists because of our members, so when the Governor attacks MEA he is attacking every one of our hard-working, conscientious teachers, educational support professionals, bus drivers, custodians, food service workers, school secretaries and other MEA members. He needs to learn that education matters, and educators matter, because we are the people who are with our students every day doing our best in spite of his actions that repeatedly demean and devalue our public schools, school employees and students. 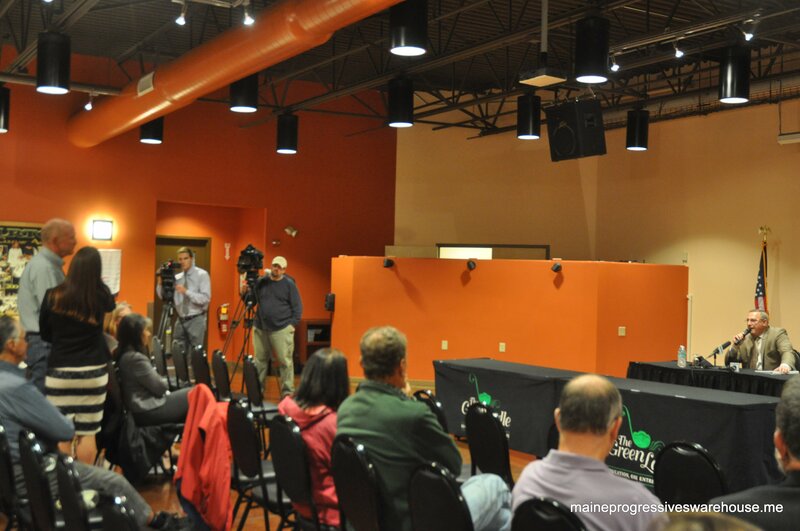 Here is the full video of Governor LePage’s town hall.